The US premiere of Darren Arnofsky’s Noah is upon us. I have been thinking a lot about why people enjoy watching the depiction of religious figures on film. In some ways, cinema is just another medium engaging in the act of religious critique. Perhaps people watch these films to see the characters as more personable. Maybe some viewers have a white savior complex or merely wish to visually experience the human divine. The possibilities are endless and subjective. In the past few weeks, I have seen both negative and positive responses to Noah. Some Christians are excited for a high-budget, religious film while others are more hesitant. I can already foresee the critique on skin color. (It happened with The Hunger Games. It will happen again here, as it should.) Nonetheless, I understand the skeptics’ point-of-view. People do tend to be more critical when looking something that has been classified as a religious interpretation, and many have been very quick to write off religious films as a type of marketable Hollywood fetish piece. My biggest apprehension when it comes to religious films is an underlying fear for the actors and actresses. By becoming the face of a contentious film, they are opening themselves up to a new type of ostracism and social commentary. Emma Watson, who plays Ila the adopted daughter of Noah, describes the film as being similar to an “epic Shakespearean drama.” I am sincerely interested in what feminine voice and quality Watson will provide a traditionally male-dominated tale. Even Watson notes that Noah is a “dark story.” She carefully calls the film “all his [Aronofsky’s] imaginings” which points to the screenplay’s direct reliance on Aronofsky’s graphic novel, Noah. Thereby giving one reason to say that while Aronofsky’s film is influenced by the Biblical story, it is not an interpretation of the Biblical story at all, but rather a script conditioned and guided by Aronofsky’s graphic novel. I would like to see Noah at some point in theatres once the fuss is over and the crowds have dispersed. I can’t promise that I will write a formal review of the film so much as a meditation. If nothing else, at least there will be popcorn. Yeahhh I was one of those people who laughed at the untold story. I want to see it for the landscape, to see how they do the rains/flood, to see all the animals. And seeing all that on the big-screen would be cool. I’ve heard that about the environmental message. If you do see it, I’d be curious to read your take on it, if you have time. Ha! on Colbert eating popcorn! Most of my friends aren’t happy with Darren Aronofsky’s version of Noah but my university might be playing it on campus later this semester anyway. I don’t have much desire to see the movie because I can’t take Rusell Crowe seriously… My girlfriend is against the film because she feels like Hollywood is doing a bait-and-hook routine with faith based movies. She doesn’t like Tyler Perry movies for the same reason. I don’t have so much of a problem with Hollywood. I am glad they are at least TRYING to make a religious movie… even though it doesn’t seem very religious in an idealized sense of the word. Its cool to see your perspective on Emma Watson because she and Logan Lerman are actually reuniting in Noah after starring in Perks of Being a Wallflower together. :-) I hope you’ll blog about the movie when you go see it. You should consider writing about Life of Pi too. That’s a favorite of mine book-wise… And finally for the popcorn. XL! At some point, I would love to blog about Life of Pi. For a moment, can we consider how cool it is that Emma Watson (who starred as a lead role in the Harry Potter franchise) is now playing a character in a religious film? I remember when the publication of the Harry Potter books and the announcement of the films caused rifts through the south during the early 2000’s. Thanks for the comment, Flann! A similar reaction happens when mythological figures are depicted on film (eg, Thor or Hercules). If the movie doesn’t get them “just right” then there is the prerquisite wailing and gnashing of teeth. However, if you really want to see some people lose their minds, just pick a movie that is based on a popular comic book franchise. This seems to primarily fall upon the beloved X-Men titles (X3: The Last Stand and Xmen Origins: Wolverine are two prime examples). When a writer mines forty years worth of backstory and cherry picks a few elements they want to see together in their vision, the legions of nerds come out and the forum screamings begin. Highly entertaining fare. I am thrilled by your great points! I learned how to read as a child through comic books, and the X-men series gives me an inescapable nostalgia. In some ways, Noah is directly inverse to the problem of creating comic book films. Whereas film creators of the X-Men and so forth have an array of backstory and optional storylines to choose from, Aronofsky had only a few paragraphs from the Bible on which to base his film. You could say that rather than “cherry picking,” Aronofsky has planted a cherry tree. Nonetheless, your points about the similarities between these two types of films and their target audiences are striking. Thank you for the comment. The last big budget bible film I saw (and I bought it in fact and watched it three times) Was Mel Gibson’s “Passion of the Christ.” I actually liked it. Your post intrigued me. You write marvelously and with probably more intelligence than I could ever hope to muster. Think ‘Ben Hur’, ‘The Greatest Story Every Told’, ‘The Ten Commandments’, etc. 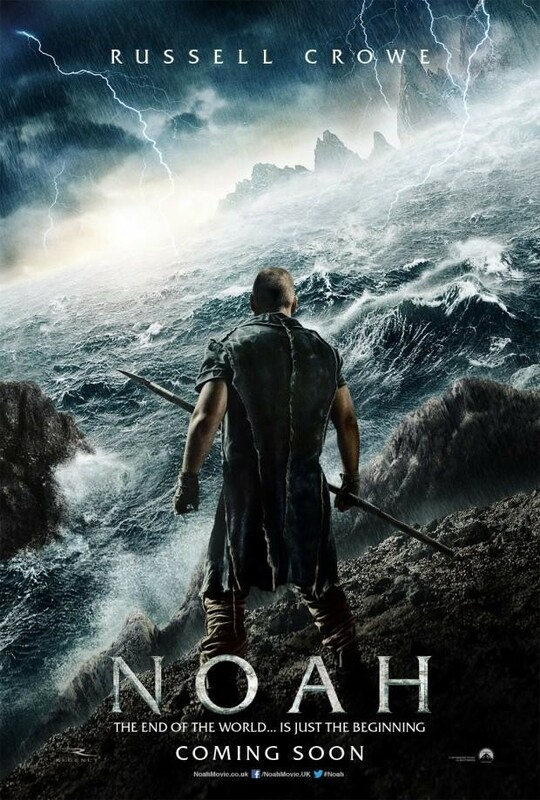 I’m looking forward to seeing Noah. All The local Christian criticism makes me think it is probably a great movie. I don’t really have an urge to see Noah, but I am raging about Michael Bay’s Teenage Mutant Ninja Turtles remake. So, I understand what it is like to not be happy with how some directors and producers do not get the details right or how they change such the story and details in a way that it undermines the origin of the subject matter. The TMNT remake is breaking my heart.